A cloudberry (Rubus chamaemorus) is a herbaceous plant in alpine, tundra and boreal forest. The fruit is an amber-colored edible fruit similar to the raspberry or blackberry. 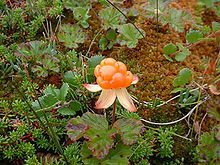 Despite great demand as a delicacy (particularly in Russia, Norway and Finland) the cloudberry is not widely cultivated. It is mainly a wild plant. Wholesale prices vary widely by the size of the yearly harvest, but cloudberries have gone for as much as €10/kg (in 2004). The ripe fruits are golden-yellow, soft and juicy, and are rich in vitamin C. When eaten fresh, cloudberries have a distinctive tart taste. When over-ripe, they have a creamy texture somewhat like yogurt, and a sweetened flavour. They are often made into jams, juices, tarts, and liqueurs. They are very popular in Scandinavia. The plant spreads by two means. Its seeds are spread by birds and mammals. Locally, its rhizomes develop into wide berry patches. ↑ Ville Heiskanen & Juho Erkheikki (28 July 2005). "Record cloudberry crop lures thousands of Finns to Lapland bogs (see § "Prices Drop"; ¶ 1)". Bloomberg. Retrieved 13 August 2015. ↑ Tart taste: a sharp, sour, or acidic flavour.